Kitchen renovations can start out as the small snowball at the top of the hill and quickly spiral out of control. Here are some tips from the experts at FLOFORM to ensure your project doesn’t begin to roll down the hill. Much like going to the hair stylist with a picture from a magazine, going into your kitchen renovation with some ideas and inspiration of your own can help you dial in the scope of your project. Do research online and make note of some key elements from kitchens you really like help determine your own style. Though we all have champagne tastes, most of us only have beer budgets. Only you can determine what size of a budget you are prepared to invest. Take some time to research the costs of average kitchen renos and decide whether or not your budget is capable of getting what you want. If not, change your expectations or wait until you have the budget you need. It’s been said that kitchens and bathrooms sell a home. And there certainly is some truth to that. A renovated, modern kitchen can dramatically affect the resale value of your home. With that in mind, a slightly larger investment now will almost certainly bring in a larger return when it comes time to sell. 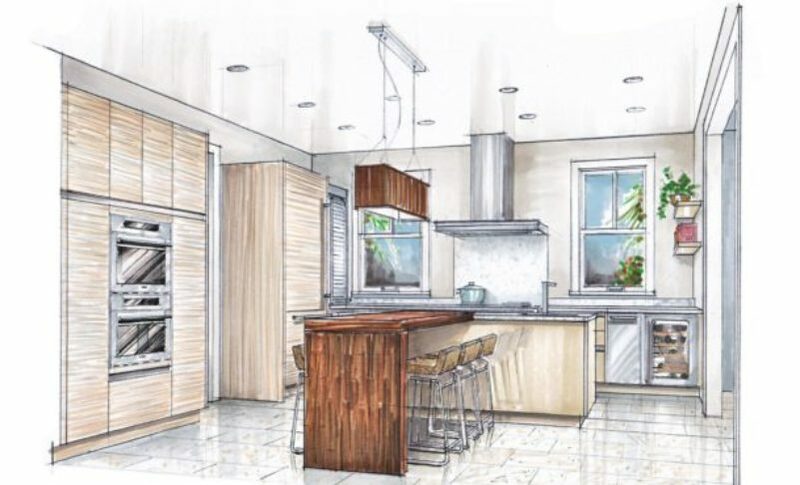 Nothing in life should be planned in a vacuum, least-of-all your kitchen project. Take the time to plan out the total look to make sure you’re comfortable with the big picture. It’s typically easier (and cheaper) to do a large project at once instead of parceling it out into individual projects. If you need help, do not hesitate to contact us! There are several materials choices available to you within each facet of your kitchen renovation. For example, options for kitchen countertops range from natural stone (granite, marble), engineered stone (quartz), solid surface materials, laminate, wood, and more. Understanding the benefits and risks of each material will help you plan. One of the most important elements in determining the functionality and the aesthetic enjoyment of your kitchen is lighting. Different bulbs (Halogen, CFL, LED) cast different shades of light ranging from yellow to bright white. The warmth or coolness of the light can dramatically change the tone, depth and overall impression of your kitchen. Anything worth doing is worth doing right. This especially applies to your kitchen. Using professionals for your project not only ensures it will be done correctly; it also provides you with the peace of mind to know that they are liable for their work. Following point seven should put you in a good position here. Reputable and professional companies always use legal contracts as part of the purchase agreement. This contract not only confirms the parameters of a project, but it also protects you by limiting your liabilities and providing a full warranty. There’s no way around it; living without a kitchen or with one in disarray is a major inconvenience. But it will all be worthwhile once the project is finished and you have the kitchen of your dreams. Just prepare yourself to live in less-than-ideal conditions for a little while. Once all the work is done, take some time to bask in the glory of a completed project before turning your attention to the next one. There’s a sense of pride in seeing your vision come to life… take time to enjoy it. FLOFORM Countertops has been selling, fabricating and installing countertops for more than 55 years.